K inside his “Dragon” head. It’s the Chinese New Year, which happens to be the only New Year celebration my oldest son K acknowledges. While we have never lived in China, K has embraced this tradition as his own. It probably has something to do with the fact that “dragons” come out and celebrate the changing of the year. Though my son swears it’s a dragon, the creature he is referring to is actually a lion. In celebrating the New Year, there are two types of creatures that come out to dance in the New Year. The Lion, which is operated by two dancers, inside the body where you cannot see their faces; and the dragon, which is often controlled my many dancers who hold the dragon up on poles, away from their bodies. But you try to make that distinction to my three-year-old. During the Chinese New Year, lion dancer troupes from the Chinese martial art schools or Chinese guild and associations will visit the houses and shops of the Chinese community to perform the traditional custom of “cai ching” (採青), literally means “plucking the greens”, a quest by the ‘lion’ to pluck the auspicious green normally ‘vegetables’ like lettuce which in Chinese called ‘cái'(菜)that sound like ‘cái'(财)(fortune) and auspicious fruit like oranges tied to a “Red Envelope” containing money; either hang highly or just put on a table in front of the premises. The “lion” will dance and approach the “green” and “red evelope” like a curious cat, to “eat the green” and “spit” it out leave it in a nice arrangement, like an auspicious character but keep the “red envelope”. The lion dance is believed to bring good luck and fortune to the business and the troupe is rewarded with the “red envelope”. Well, ever since the dragons came to K’s school and home last year, performing their daring dances up on stilt polls, K has been hooked. We have a recording of one of the dances on our ipad…he watches regularly. Over the past year, K can often be found pushing all of our dinning room chairs together and dancing on top of them like the dragon; or he might be dance back and forth on our couch, dancing like the dragon. I have numerous bedtime stories all centered around the dancing dragons, the drums that call them, and the cymbals that crash during their performance. As the January 1st New Year was approaching, K got very excited that the dragons would be returning. We tried again and again to explain that there would be no dragons on that New Year celebration; that we would need to wait until the Chinese New Year in February…he didn’t quite get it and kept looking for those elusive Swedish dragons in January. 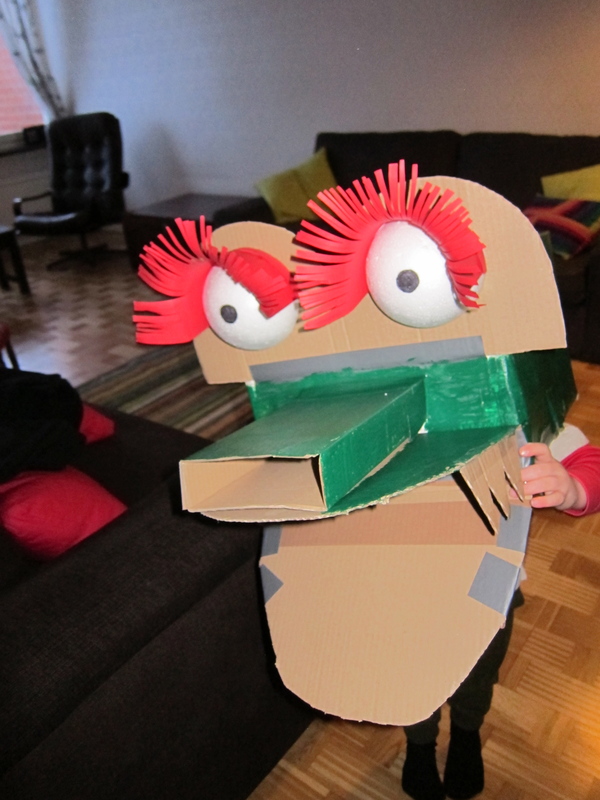 In the end, my wonderfully talented wife sat down with K to create his very own dragon that he could dance in. K was super excited, and because K is such a committed follower of the dragon, today he was invited to perform at this preschool for all of the kids. While I couldn’t attend, my wife recorded a bit of it and it looked awesome. K had the dragon head on and was leading the dance for the school, but he had all of his classmates following behind, creating a long serpentine dragon that danced through the students. Then, each class gave the dragon a red envelope with 1SEK inside to bring good luck to them during the Year of the Snake. This is just another reason why it is so awesome being Family Nomadic! !